What is a flex wall? What is a pressurized wall? What is a one-bedroom flex? Pressurized walls are the easy, quick and convenient way to make the most of your space. Born out of necessity for city residents, pressurized walls NYC make it possible to live in the city – and have enough of your paycheck left over to eat, too. A pressurized wall is a temporary wall that looks and acts just like a conventional wall, but is constructed using only pressure, so it causes no damage to the existing structure. Pressurized walls can be built in both commercial and residential spaces, for a wide variety of reasons. 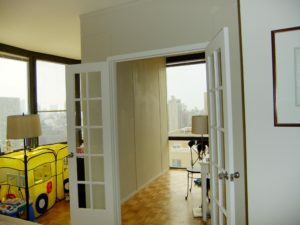 A common request for a pressurized wall is to turn a one-bedroom apartment into a two-bedroom apartment, often by converting the common living area into a bedroom by adding a wall. Pressurized walls can also turn a studio apartment into a one-bedroom, by dividing the living area from the bedroom area. They can be used to create another bedroom for a growing family, as well. In commercial spaces, a pressurized wall can be used to create distinct office spaces. Different employees can enjoy private areas, or your company can create different meeting areas, workspaces or retail areas. The seamless nature of a pressurized wall ensures that no one will ever know that it wasn’t part of the original floor plan. Pressurized walls look and function almost identically to a conventional wall, and can be used in the same way. Users can paint their walls and decorate their pressurized wall in the same way that they would any other wall. Personalize your pressurized wall with our many customization options: French doors, pocket sliding doors, windows, shelves and closets can all be built in, making your wall just right for your needs. Call Temporary Walls NYC to start your transformation today!